Your kayak is only good if you can get it from point A to point B with it. It certainly does you no good to sit at home with it. That is why having a trailer is so important. For those with multiple kayaks, getting the best 2 kayak trailers is a great way to transport the whole family’s boats. Kayaks are a good investment and that is why having the best kayak trailer to transport them are so important. You will rarely find a single kayak trailer. This aspect will allow you to grow your amount of gear without having to upgrade. You will find trailers for kayaks are some of the best ways to transport your gear. Malone is a standout company when it comes to trailers. Not only do they use high quality materials but they think their designs through. They believe so strongly in their product that they include a 5 year warranty. The Auto Racks MicroSport Trailer can carry up to 4 kayaks or canoes weighing up to 350 lbs. and up to 19 feet in length. This extended length even makes it compatible to carry your SUP boards making this trailer increasingly desirable. 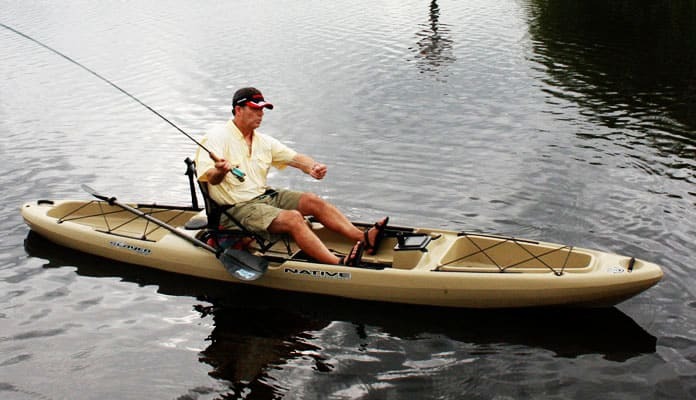 The Auto Racks MicroSport Trailer can even be classified as the best fishing kayak trailer as it can haul some of the longest kayaks on the market. It does this by its marine grade pre-galvanized frame which is also rust resistant. This is ideal for those who venture into the ocean as you will not have to worry about corrosion. Even their wheels are galvanized so you can drive the trailer right into to the water. This means that you will no longer have to haul your kayak in and out of the water. Malone even includes a spare tire for you which will help keep you safe. You will find that this package even includes J-style kayak saddles to make attaching your kayaks even easier. This user friendly package comes with clear instructions to make building this trailer easier. Malone made this heavy duty Xtralight trailer that has a military grade galvanized steel frame you can trust. With leaf spring suspension you can be assured that your kayaks will be protected even on bumpy roads. The heavy duty axle features 2 sets of padded V racks which allow you to transport your kayaks without a scratch. With a 2 kayak capacity, it is clear to see why this is the best multiple kayak trailer. Malone includes everything you need to pull your 2 kayak trailer including 12 foot load straps and mounting hardware. 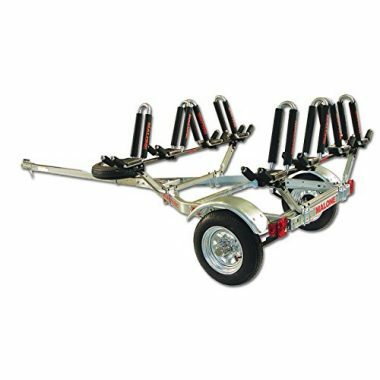 This easy to assemble tandem kayak trailer takes only a couple hours to assemble and delivers superior performance. Coming with a 5 year manufacturer’s warranty this is a trailer and company that you can trust. With a 275 pound capacity, you can transport your kayaks, canoes or even SUPS on this trailer. This is the best 4 kayak trailer that can hold up to 4 kayaks. Like most trailers on our list this one is made from marine grade galvanized steel. The frame is a T-Box design that uses a leaf spring suspension system. You won’t have to worry about the axle as it’s also galvanized and heavy duty. The wheels are on the smaller size at 8 inches but can still carry up to 4 full sized kayaks, stand up paddle boards or even canoes weighing up to 275 lbs. Your gear will rest on foam blocks included with this trailer. This is the best tandem kayak trailer. It can carry up to weighing up to 355 lbs. The cool thing about this MicroSport trailer is that you will get better gas mileage than simply putting your kayaks on your roof. The trailer itself is constructed out of marine grade galvanized steel which is lightweight and rust resistant. The entire trailer weighs under 200 lbs so it won’t put that much strain on your vehicle. This trailer allows you to carry kayaks up to 19 feet long. It assembles in no time and pre-fitted electrical and mechanical assemblies. If you’re looking for the best kayak car trailer this is the one for you. It is made from a lightweight yet strong galvanized steel frame which sits on 12 inch wheels. 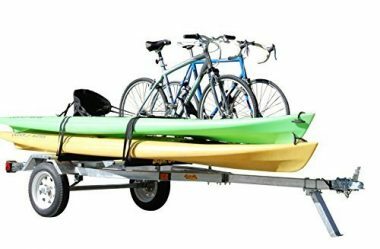 This trailer can carry everything you use in the summer including kayaks, stand up paddle boards, and bicycles. This is done by having extra long crossbars which are compatible with every roof rack style. The kayak car trailer also has LED lights that show people when you’re turning and breaking. It even has springs that give your gear the smoothest ride possible. All of this is included in the trailer package and is easy to setup and install. It is also watertight so it will stand up to mother nature and being submerged for short periods of time while you unload. Kayak trailers are a great way of getting your kayaks to the beach. 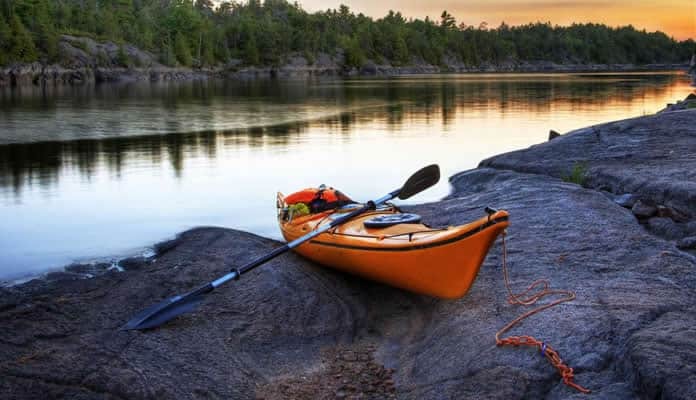 Best lightweight kayak trailer reviews agree that there are a few key features that you should be aware of before purchasing one for yourself. Some of the best kayak trailers will be made from different materials and be able to carry different amounts of kayaks. A few trailers can even haul more than just kayaks which are perfect for people with families. When shopping around for your the best kayak trailer, be sure to consider a few things before choosing the right one for you. Different trailers come with different features, most importantly the number of kayaks they will carry and their towing capacity. There are many different trailers on the market all offering something a little different. It is important to pay attention to the specs on the trailer you are considering before you decide on the one you would like. This varies trailer to trailer. All of the kayaks on our list can carry between 2 and 4 kayaks. For those looking to carry even more, you can still carry 2 more kayaks along the roof of your car if you have a kayak roof rack. The XtraLight 4 Kayak Stack Trailer Package by Malone is a great option for those looking to carry four kayaks. There are specialty trailers, like those for kids camps, that can hold up to 16 kayaks. Generally speaking, you won’t need this capacity unless you work for a kayak rental shop. Tandem kayaks are often quite a bit longer than standard solo kayaks which could pose a problem for your trailer or kayak. Be sure to look at how long your kayak trailer is suited to carry. The Auto Racks MicroSport Trailer by Malone is a great option for those looking to tow a tandem kayak as it has a 19 foot kayak length capacity. It is important to consider how long of a kayak your trailer will be able to accommodate for the main reason if you don’t want a lot of overhang. Having overhang on your trailer can result in your kayak not sitting as securely and can risk an accident. More than just tandem kayaks, ocean kayaks tend to be a lot longer in length as well so be sure to consider this before purchasing. Nearly all trailers can haul more than one kayak. This is a great way to transport your friend’s or family’s kayak. When hauling more than one kayak it’s important to ensure your vehicle is able to handle that much weight. 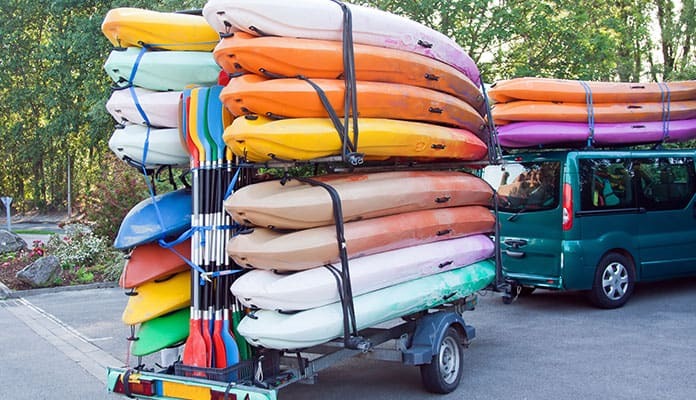 Keep in mind that you not only have to factor in the weight of the kayaks but also the weight of the trailer and any other gear strapped to the trailer. But some also allow you to haul other gear as well. This can vary between a canoe, paddleboard for paddleboard enthusiasts or even bikes. This will be indicated in the description of the best canoe trailer. Just keep in mind that you may have to get separate adapters that allow this. Every single kayak trailer has a maximum weight rating. If you already have a kayak it’s important to check it’s weight as to not exceed the trailers limit. The average kayak will weigh around 40 lbs while the typical single large kayak trailer can be be rated for a weight of about 200 lbs. If you exceed the limit you can risk it breaking in transit. Having a place to store your trailer can be tricky. A way to get around this is to get a foldable trailer. They offer the same portability as a rigid one but are much easier to store at your home. As these trailers are often quite heavy, you will want to have a designated area for storage. Kayak trailers are also a great way to store your kayak. Instead of having a special place set aside in your garage you can simply keep it attached to your kayak under cover. This will also allow you to get to the beach much quicker than having to setup the rack and put your kayak on the trailer. 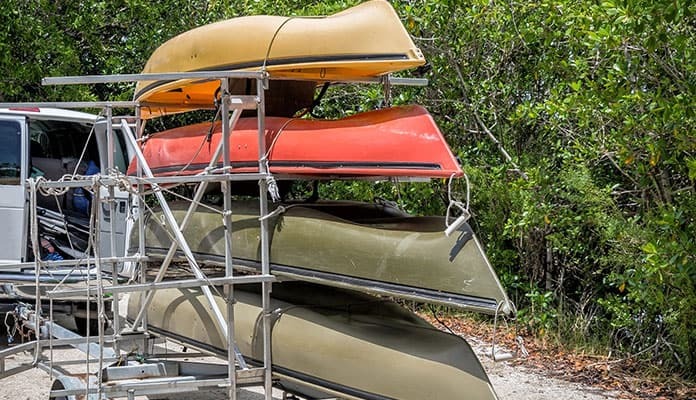 Figuring out where you are going to store your kayak trailer is an important consideration that should be made before buying. Be sure to ask around as you may have family or friends that have more land and are able to store for you. Kayak trailers can be more money than a roof rack but can offer you more room storage space on top of your car. This is especially ideal for those looking to carry more kayaks or who don’t want to drill holes into the roof of their car. As with every purchase you make, it is important to consider cost. You do not want to step outside of your price limits as this change in budget can make you unhappy with this purchase. Buying a pre-built trailer is often quite a bit more expensive. For those who are on a tighter budget, buying one that you will have to build yourself is a much better option. Like most other things, buying online is a great way to reduce your price and get the best deal possible. If price is of serious concern to you then you may want to opt for a used trailer. These will typically run quite a bit cheaper but can be quite a bit harder to find. Kayak trailers need to made of a lightweight yet durable material. This job usually goes to a specialized type of steel. Galvanized steel is not only light and strong but also rust resistant. This allows you to pull right up to the water, and even into it, to launch your kayak. Knowing that you can use your trailer the way you want will increase the amount of time you’ll use it. It is important to not compromise on quality when it comes to materials for your trailer. Having higher end materials will help you to get drastically more use out of your kayak. The tongue of a trailer is the distance from where it connects to the hitch ball. If this distance is too small you risk hitting your car when taking sharp corners. It may seem like overkill for this to be a far distance from your car to the start of the trailer but you will appreciate it when you’re trying to turn around. This is what gives your kayak a smooth ride down the street. Even though this may seem like an important aspect of your trailer it’s only necessary to consider when riding down dirt roads. Your trailer will hol your kayak and ride smooth even with a stiff suspension when on paved roads and highways. Some trailers do come with specially designed suspensions. These are the ones you’ll want to consider if you do travel on dirt roads regularly. Potholes and washboard roads can cause havoc on your kayak trailer or your kayak. How Many Kayaks Will You Carry? You will need to figure out how much gear you actually need to carry. 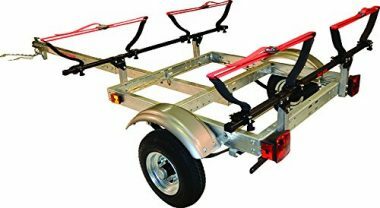 These trailers range from 1 to 4 kayaks but won’t be hauling any more than that unless you get a specialty trailer. Every trailer on our list is lightweight yet built from materials that make them strong to hold plenty of kayaks. This is done by using a strong galvanized steel. It is not only one of the strongest and most durable materials, it is also rust and corrosion resistant. This means that you can pull the trailer up to the ocean without worrying that it will start to degrade. What Size Are Your Kayaks? Trailers specialized for kayaks are designed to be able to handle the longer length of your kayaks. Understanding that many people opt for tandem kayaks, trailers typically allow for the longer sizes. This is especially ideal for those who are looking to tow along their paddle boards as well. Be sure to always check the length restrictions that your trailer will have. You do not want to be driving down the road with a ton of overhang from your kayak. Typically speaking the length of your trailer tongue will determine the length of a kayak trailer can hold. While opting for a compact trailer may be desirable, it isn’t always the best idea for this very reason. Being restricted with what you can tow along with your trailer can be frustrating. Be sure to avoid this frustration by having all the facts before you make your purchase. Kayak trailers are not small, after all, they are designed to carry long kayaks. Having the tools and the know-how to properly put together your trailer is important. Do you have the space to work on properly assembling this trailer? All of these are important steps in determining whether buying a kayak online is a good idea for you. Breaking this down into the two most important sections it’s important to first question whether your mechanical skills are up to putting this together. After you make your purchase you will have a ton of large steel filled heavy boxes delivered to your door. You must really ask yourself: do you have space, time and understanding to put this together on your own? If not installed correctly this can end up costing you a lot of money and be incredibly dangerous for you when on the road. 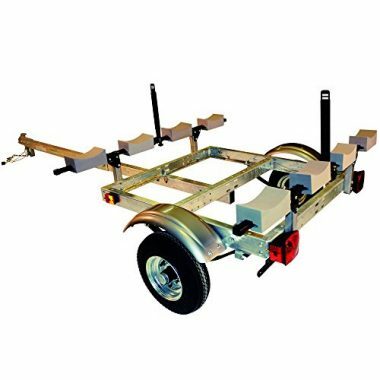 The next question you should ask yourself is whether or not you have the tools needed to assemble your trailer. If you do not, most tools can easily be rented from local hardware stores that will help you get what you need. Keep in mind the cost of these rentals though. In some cases, it can cost as much to rent the tools needed to install it than it does to simply buy a pre-assembled unit. You will find that in most cases the kayak trailers you are choosing between have tires of similar size. If you come across trailers that utilize different sized tires, there are some things you should remember. Smaller tires are good to use if you are transporting a lightweight load on well kept roads such as in cities. They are more economical to pull and result in better gas mileage. If you plan to go on any sort of rougher terrain, opting for bigger tires are a better option. Many lakes require you to meander down to dirt roads and rocky paths for water access. Having bigger tires means you will not have to carry your kayaks far and an instead pull up right to the water’s edge. As there is a wide selection of options when it comes to kayak trailers, understanding what you are buying is important. To get a full picture of the trailer you are choosing you will want to thoroughly compare trailer options to others on the market. Not just in price but in features as well. Looking at the trailer weight is especially important in determining what type of car you will need to tow it. 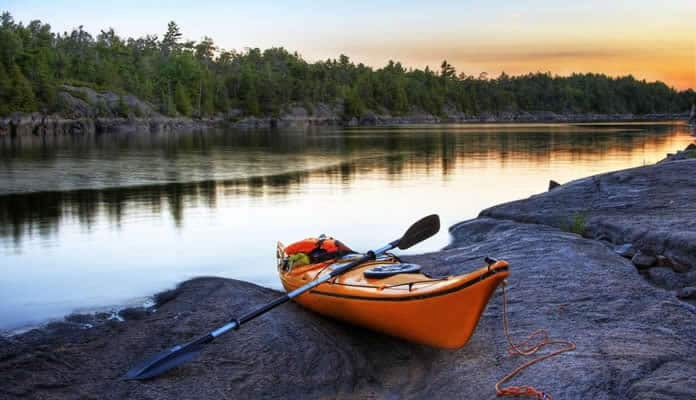 Be sure to take the weight capacity into account not only so you can decide if it will hold your kayak but also so that you are sure your vehicle will be able to tow it at full capacity. Checking how many kayaks it will tow is also important as well as the length of kayak suitable for it. This will show you if you will have the option to tow paddleboards and canoes as well. Finally, be sure to check the crossbar width as well as the warranty that comes with. Q: How To Tie Down A Kayak On A Trailer? A: Most kayak trailers will have a specially designed way of tying down your kayaks. Most have crossbars that you will have to add your own racking system while others will include these solutions in the overall package. You will then strap your kayak to your kayak trailer. We recommend using ratchet straps if the tie down system isn’t already included. They will give you control over how tight you attach the kayaks. Ratchet straps are easy to use and provide excellent value for what they do. Just keep in mind that if your kayaks are longer than 10 feet overhanging from the end of your trailer you will need to have a red flag on the end of the kayak. This will alert drivers to your extra long lode so they don’t end up hitting it. This can be done by simply taping a red piece of cloth to the end of your kayak trailer or kayak. Q: How To Lock A Kayak To A Trailer? A: Most kayaks aren’t meant to be locked onto a trailer. You can attach a lock to the strapping system found on most kayak trailers but this will only slow down people looking to steal your gear. This can be ok for a short term stop but we strongly suggest that you don’t leave your car unattended with anything on your trailer. You should do your shopping and prepare for the trip beforehand. Q: What Is A Kayak Trailer? A: A kayak trailer is a lightweight trailer that is specifically designed for hauling kayaks, canoes or other small water devices. As they are transporting kayaks, most are made of marine grade materials that are designed to not rust over time. They typically have padded sections so they will not cause any damage to your kayak. Q: How To Properly Secure A Kayak? A: Securing your trailer is critical to ensuring it gets to your destination safely. A lot of kayak trailers come with straps included in the package. If they aren’t we suggest getting a set of ratchet straps. These are great since they allow you to be quite precise with your tightness. Every kayak trailer has a different place to strap to. But all of them should have at least 2 points. They will usually be on either side of the cockpit of your kayak. This will ensure the kayak doesn’t move around in transport. When tightening the straps that secure your kayak to the kayak trailer it’s important to find the ideal tightness. If you strap it too loosely you risk it shifting when you’re driving. But that the same time, if you secure it too tightly it can warp the outer shell of your kayak. To strap your kayak properly get the straps tight and add one extra rung on the ratchet. Make sure the straps are completely straight. If they are at an angle the straps will become loose when you start driving. This will ultimately cause your kayak trailer to shift and even have your kayak fall off the trailer. You can tell it’s strapped properly when the kayak won’t move when you push on it when the straps are completely vertical. Q: Can I Travel Long Distance With A Kayak Trailer? A: If all is correct with your kayak trailer than there is no distance limit to towing it behind your car. This depends on 2 main things. First, you must ensure that the weight of your kayak trailer remains in the safe towable limit of your cars hitch rating. Second, you will want to ensure that your kayaks are properly secured. If all of this is correct, then you will have no problems towing your kayak trailer for long distance travel. Q: How Much Weight Can A Kayak Trailer Hold? A: This varies from trailer to trailer. The Kayak XTRALIGHT Trailer Package by Malone can support a weight of 275 pounds. While this sounds like a lot of weight, the Auto Racks MicroSport Trailer by Malone can hold a more impressive 350 pounds. Every kayak trailer that you look for will inform you of 2 different weights: the weight of the trailer and the total load capacity. Q: How Many People Does It Require To Put A Kayak On A Trailer? A: Ideally, it should require only one person to load your kayak trailer but in reality, it depends on the person and the weight of your kayak. More people make for lighter work so having a friend help you to load your trailer will be safer on your body and a lot less tiring. Kayak trailers don’t weigh that much. If you are trying to get it hooked up alone we suggest getting your car’s hitch close to the trailer and simply lifting your kayak onto the hitch. Doing this when the kayak is off the trailer will make the process much easier. Q: What Is The Best Vehicle To Pull A Kayak Trailer? A: While many people mistakenly think that only big trucks and SUVs can tow a loaded kayak trailer, this isn’t the truth. Any vehicle that is equipped with a tow package can pull a trailer. It is important to look into the weight rating that your vehicle can tow as well as the hitch rating. Be sure to not only take into account how heavy the trailer is but also the weight of the trailer fully loaded with kayaks. Keep in mind that due to the additional weight, your vehicle will drive differently. You will need to remember to go slower than normal and take wide turns. It’s also important for your vehicle to have good brakes, especially when traveling on highways. If you don’t feel your car can handle the extra weight we strongly recommend you get them looked at before adding the weight of a trailer and kayak. Keep in mind that if your kayak sticks out more than 6 feet you will need to have a red flag on it. This will show other drivers that you are carrying a long load and ensure they don’t bump into it. This is a regulation for most states, but the footage of the overhang can differ. It’s important to check what your state’s regulations are. 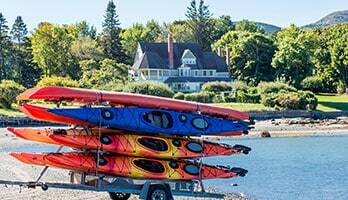 What good is having small watercrafts such as kayaks and canoes use out of your kayaks if you can’t easily transport them from your house to the water? There are many different kayak trailers on the market. All of these are lightweight enough to be used by smaller vehicles to tow your small kayaks. Having a trailer is a great way to ensure that your kayaks stay safe and free from damage. They also allow you to get more use out of your kayaks as you are able to transport them with ease. 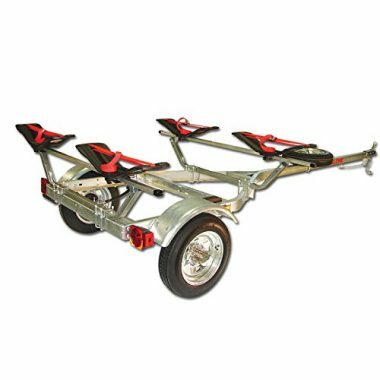 It is important to look for the best kayak trailer that is user-friendly. Ideally, being able to hook your kayaks up on your own will make your kayaks much easier to use. Do you use one of the kayak trailers that made it on our list? Let us know how it works for you in the comment section below.